Um verdadeiro paraíso de paz e tranquilidade, Oakleaf Lodge é um cativante 5 quartos à beira do lago de divisão casa localizada ao longo das águas calmas de Cherry Creek Cove. Prazeres sublimes aguardar se você gosta de seu café da manhã na marquise brilhante e alegre, afago na frente da lareira crepitante na lareira de pedra, ou saborear magníficas vistas para o lago filtrados a partir do deck envolvente expansiva. Durante o dia, passar dias quentes de verão natação e canoagem a partir do cais privado, localizado do outro lado da estrada. À noite, observar estrelas como você relaxar nas fumegantes banheira de hidromassagem exterior ou assado marshmallows do poço à beira do lago de fogo. Na fronteira com Deep Creek State Park, você vai adorar as trilhas que cercam! Uma verdadeira experiência de Deep Creek é apenas uma chamada de distância! Ligue hoje para fazer planos para sua futura estadia em Oakleaf Lodge! Para sua conveniência, esta casa oferece wifi gratuito. I was very unhappy with the location. We stayed at Oak Leak Lodge last week and everything was perfect. The house was clean, easy lake access (once you get used to the hill!) it was exactly what we were looking for and the price was right. We would definitely use this rental again. Thanks, Chris! So glad you enjoyed your stay. The house does sit on a hill but the lake front across the street is amazing. We hope you come see us again! Although the weather wasn't completely cooperative, we enjoyed our stay at Deep Creek Lake. The house, Oakleaf Lodge, was pretty, large, and had everything our family needed to enjoy a week at the lake. Thanks, Cheryl! Glad to hear you enjoyed your week! Hope to see you again! We had 7 adults and 4 children and were happy with the layout and cleanliness of the space both to gather as a family and also to spread out and have some quiet time. Our first impression was that the house was nicer in person than what the photos showed. The kitchen/dining area/living room is a great central location to be together and we really enjoyed spending time there in the evenings and roasting marshmallows at the huge fireplace. The porch is large enough to accommodate a group meal, but without enough seats for more than 6. 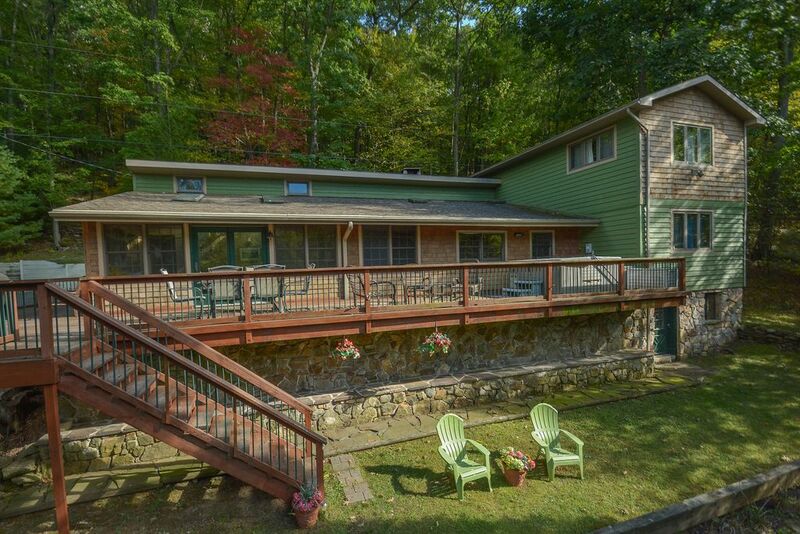 Great for: - wonderful view of the lake and dock from the porch - only 1.5 miles to the State Park - clean! - hot tub: we used it every evening to warm up after swimming in the lake. Appreciated the locks for safety from young children. - convenient parking: 2 spots are on the same level as the main floor of the house. 3 additional are down an additional staircase from the main profile photo shown. - plenty of wood for the living room fireplace with a convenient pass-through to easily stock the living room directly from outside without carrying the wood through the house. A few areas of improvement: - steepness of driveway: for elderly and guests with physical challenges, please note that this driveway is very steep from the house down to the dock. Most in the area are similar, but worth noting. - dishwasher: the soap wouldn't fully dissolve and the top rack gets weighed down and prevents the water sprayer from spinning. We rewashed most loads and had to hand wash more dishes than we cared to. - more dishtowels, please (two isn't enough for a full week) - sunroom seating: we enjoyed the bright morning light in this large room but were disappointed that there was only seating for four people Ultimately, we would recommend this house for other guests looking for a comfortable and peaceful stay and easy access to the State Park. We had a group of 10 and were loved it! There was plenty of room to socialize or hibernate in your room. Aside from the centeral air each room had an electric heater which was very convenient. No one wanted to leave after our 3 nights were up! The kitchen has everything you need to to cook. HIGHLY RECCOMEND TOILET PAPER, TRASH BAGS, AND TOILET PAPER. Upon arrival we were disappointed as we did not realize the property was on a extremely steep driveway and snow was on the way. “Highly recommending 4wd” doesn’t clarify the grade however the snow was plowed the day after the storm. One last complaint, the master bedroom located next to the main entrance has a major failure with the shower door getting stuck. This really needs to be addressed as two guest were stuck for some time. We loved the house. Very cold in the living room but they do provide firewood. would definitely stay there again. Thanks, Eliant! Hope you come back and see us. As seguintes datas têm um requisito mínimo de estadia de 3 noites: Dia do Presidente, Dia Memorial, 4 de Julho, Dia do Trabalho, Dia de Ação de Graças e Véspera de Ano Novo. Mínimo de 3 noites exigido em junho-agosto para todas as casas que permitem semanas parciais. Casas de acesso à beira do lago e lago requerem uma estadia mínima de 7 noites 6/8 / 19-8 / 26/19. Taxas e amenidades estão sujeitos a alterações sem aviso prévio. Você deve ter 25 anos de idade ou mais para alugar um imóvel com Taylor-Made.